Not sure what they are - but they are pretty! It is not necessary to know what something is in order to appreciate the beauty of nature. Hi amsav, Many thanks, I appreciate your comment. Mike, you have a knack of cheering me up with these lovely photographs. Pd. Even the name is lovely! Yes, it is an Oleander, Mike. I guess we must share a similar climate to Oz, or at least to Sydney, in that the oleander is also prolific here in the Algarve, as is the lovely Jacaranda tree that you photographed the other day. Yes, it's oleander, don't make tea from the leaves though - they're poisonous! 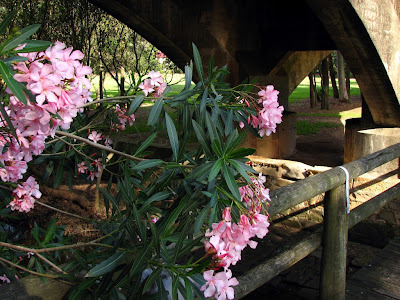 Oleander is one of the most poisonous plants and contains numerous toxic compounds, many of which can be deadly to people, especially young children. The toxicity of Oleander is considered extremely high and it has been reported that in some cases only a small amount had lethal or near lethal effects (Goetz 1998). The most significant of these toxins are oleandrin and neriine, which are cardiac glycosides (Goetz 1998). "Cardiac glycocides are naturally occurring" plant or animal compounds "whose actions include both beneficial and toxic effects on the heart" (Desai 2000). They are present in all parts of the plant, but are most concentrated in the sap. It is thought that Oleander may contain many other unknown or un-researched compounds that may have dangerous effects (Inchem 2005). Oleander bark contains rosagenin which is known for its strychnine-like effects. The entire plant including the milky white sap is toxic and any part can cause an adverse reaction. Oleander is also known to hold its toxicity even after drying. It is thought that a handful or 10-20 leaves consumed by an adult can cause an adverse reaction, and a single leaf could be lethal to an infant or child. According to the Toxic Exposure Surveillance System (TESS) in 2002 there were 847 known human poisonings in the United States related to Oleander (Watson 2003). There are innumerable reported suicidal cases of consuming mashed oleander seeds in South India. In animals, around 0.5 mg per kilogram of body weight is lethal to many animals, and various other doses will affect other animals (Inchem 2005). Most animals can suffer a reaction or death from this plant.